These bites are an excellent low calorie snack or appetizer to have before well-balanced meal. Since they are mostly carbohydrates, enjoy a couple before a meal high in protein and moderate in fat. Preheat oven to 375°F. Wash and dry beets. Separately cover each beet with aluminum foil and roast in the oven for 20-25 minutes. Remove from oven, unwrap the foil and let cool. Zest the orange and grind using a mortar. (If you don’t have a mortar, place the zest in a zip top bag and pound using a glass bottle, rolling pin, or meat pounder). Set aside. Cut the orange in half. Remove the juice and discard (or drink for extra Vitamin C!). Cut the remaining pulp of the orange into small pieces (avoiding the rind and white pith) and set aside in a separate bowl. When the beets are cooled, peel each beet with a paring knife or vegetable peeler and dice into very small pieces (about the same size at the orange pieces). Combine beets, orange zest and segments, parsley, honey, and vinegar. Stir. 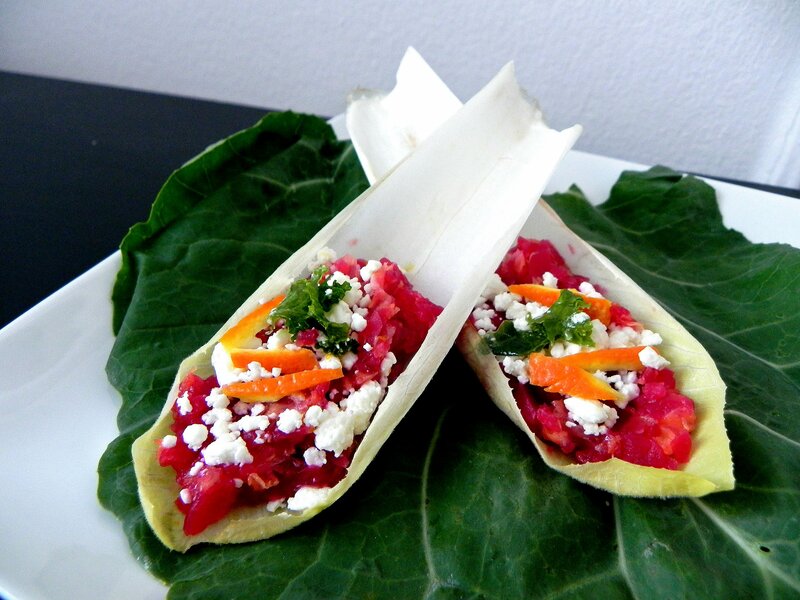 Evenly divide mixture among endive leaves and top with crumbled feta.